We are often asked about our farms and ranches and whether there are standards that we require for membership. Yes, there are. 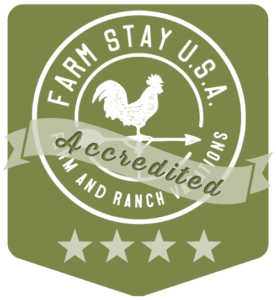 All farm and ranch members sign off on our Accreditation Standards. For transparency, these are self-reported by our members. The badge on a farm or ranch listing has stars indicating how many of the standards the farm fulfills (recognizing that our farms come in all shapes and sizes and there may be a standard they cannot honestly tick off). Our farm/ranch offers an authentic look into the agricultural lifestyle of farming and ranching. We are farmers and ranchers. We are here to answer questions, demonstrate our daily routines, and provide knowledge about farming operations. Our farm/ranch is visitor friendly. This means we make an effort to interact with our guests young and old and to include them in farm activities where possible. Safety and cleanliness are paramount. We provide clear instructions about livestock, landscape, equipment, and other hazards on and around our property. We offer clean and comfortable accommodations. We are the face of our agricultural operation. While we may have workers to help us, we are present on the property, managing the agricultural operations, and interacting with our guests throughout their stay. Meals, when included and when possible, are made from local sources and/or from the farm itself. *Members who sign off on these standards are acknowledging they run their operation in accordance with these guidelines.